The Report, December 2016, WordPress translated. First impression: this Report does not read like a thorough and carefully professional, independent evaluation of the technology. It includes much peacock language. It seems to have been put together somewhat haphazardly, and includes typos or usages that would be rejected by a professional proofreader or editor. This has not escaped notice. “Per say” for “per se” stands out, and will be (and has been) used by pseudoskeptics to attack the Report. None of this, in itself, impeaches the accuracy of the report, but indicates some anomaly in the process. This is a Progress Report. It must be considered preliminary. It is entirely possible that this has not gone through internal SRI review, which is what McKubre cited when pointing out that his SRI reports were so vetted. It is not clear that SRI approved the release of this report, and indications are that it did not. Nor does Tanzella indicate release, this was a private progress report given to Brillouin. However, it is written as if the audience is broad, and the peacock language shows polemic intent. Tanzella may be personally enthusiastic, but would bridle that horse as a professional. He seems new to this, even though he has been working for SRI for many years. Previously, everything authored by him, listed in the lenr-canr.org bibliography, was co-authored with Michael McKubre. I looked at a McKubre report done for EPRI. There are conclusions in that report that I could see as possible peacock language, so my identification of “peacock” here — by putting text in red — should be subject to judgment, particularly considering necessity. I.e., if the research program required making conclusions that are then reported, this may be fully acceptable. However, if they are not necessary, and if there is suspicion that they were added to promote SRI or the customer, it may be a problem. Original text considered peacock is in red. Comments are indented and in blue. There is no indication of any review or approval. Information in this report is Client Private and may contain Brillouin Energy proprietary information. There is no indication of any review or approval. The report was fairly quickly released by Brillouin. In August 2012, SRI International (SRI – https://www.sri.com), was contracted by Brillouin Energy Corp. (Brillouin – http://brillouinenergy.com) to perform independent studies of Brillouin’s low energy nuclear reaction (LENR) reactors, as well as advise on related Brillouin LENR research. We have operated these reactors to observe, monitor, analyze, advise on, and independently verify Brillouin’s LENR evolving research & development work, test systems, and test results. This report documents the most recent results obtained in SRI’s laboratory, as well as verification and validation of results obtained in Brillouin’s laboratory over the course of the past nine months. Brillouin indicates that it has designed the control systems in its reactors to drive the underlying physics of LENR, as described in its Controlled Electron Capture Reaction (CECR) Hypothesis, which is how it believes its reactors generate controlled LENR Reaction Heat. This Report does not attempt to prove or disprove Brillouin’s CECR Hypothesis. The systems tested and described in this report consist of three parts – cores, reactors and calorimeters. The cores are the reactive components of the system. The reactors provide the environment and stimulation that causes the cores to produce LENR reaction heat. The calorimeter is used to measure the thermal efficiency and absolute heat produced by the core-reactor system. The calorimeter was designed by both SRI and Brillouin personnel to be perfectly matched to the reactor for accuracy of measurement, whose results are described in this report. That the heat is from a “LENR reaction” is assumed. The statement is conclusory. SRI has brought over 75 person-years of calorimeter design, operation, and analysis experience to this process. We have used our expertise in LENR calorimetry – the ability to measure input and output power in the form of electricity or heat (energy balance power gain), to validate the results that are summarized in this Interim Progress Report. Brillouin’s system design relies upon compensation calorimetry, which is an accepted method of examining the variables that affect power gains. It is not clear how LENR calorimetry differs from ordinary calorimetry. Heat is heat. Any assumption that heat is LENR-originated can lead to errors. Analysis may show that the heat is anomalous, and that can lead to a possible “LENR” conclusion, but it’s best for LENR study to look for and show correlated ash or other LENR indications. For this work, one would think that it would be enough to show the heat and correlation with controlled conditions. Anecdotal heat which could be cherry-picked as “best results” from many experiments is much less satisfactory. I have had the impression that McKubre showed all the experiments in his report on the Energetics Technologies SuperWave study. If so, that was highly commendable and gives much more information than a “best results” report (such as the parallel ENEA report). 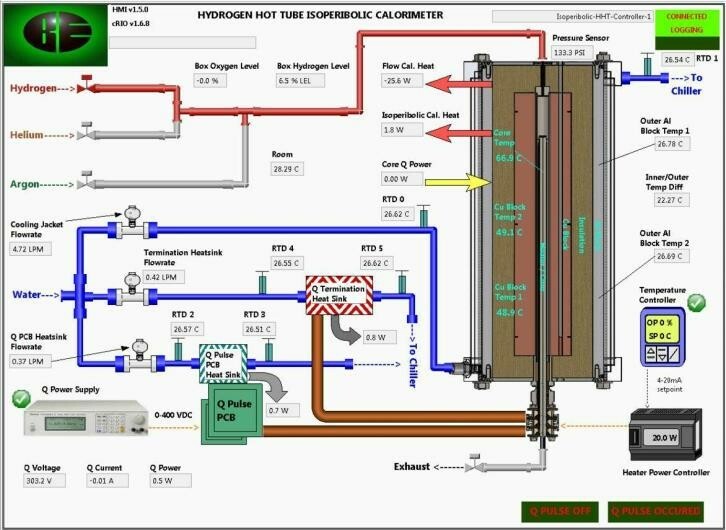 Since the start of SRI’s independent advisory and experimental verification and validation role in August 2012 to date, Brillouin has developed its uniquely fabricated, hydrogen “gas-based” reactors, known as its “Hydrogen Hot Tube” (HHT), in order to prove its Hypothesis that it can generate controlled LENR Heat on demand for potential industrially useful applications. During this time, Brillouin has run many experiments at its headquarters lab in Berkeley, as well as experiments at SRI, producing at various times a wide range of tell-tale indications of actual LENR Reaction Heat in its HHT reactor test systems. Perhaps. “Wide range”? This is a report on BE work, not the SRI work, as I read it. Why is SRI telling BE what they have done? This is why I suspect the report was made to support BE publicity. SRI has aided in the evaluation of the effectiveness of the two gas mass flow calorimeters used with Brillouin’s first generation (GEN1) HHT reactor using ConFlat® fittings. We have also been instrumental in the design and development of the isoperibolic (IPB) calorimeter used to measure and validate the energy balance of Brillouin’s second generation IPB HHT reactors. Brillouin had two identical IPB systems built, calibrated and tested at Brillouin’s lab. A 3rd identically built IPB HHT is presently completing its final calibration tests and is anticipated to come online before the end of 2016. Why is the future being predicted? Why are construction details in the introduction? Between the end of September and the beginning of October 2016, Brillouin further de-constructed [sic, deconstructed, dismantled probably better] and transported one of its first two IPB HHTs down to SRI in Menlo Park, and subsequently reconstructed the system, in order to allow SRI to run this IPB HHT independently. The transferred IPB HHT has since been used for the past two months to complement the experiments being performed at Brillouin. The design of the Brillouin IPB HHT involves a conventional resistive heater used to maintain a constant temperature in the reactor while adding additional proprietary electrical “Q” pulses to the system to stimulate the specially designed core to yield LENR Heat. This becomes evident if the total output heat measured is greater than that from the heater and the Q-pulse power imparted to the core. Upon generating a positive LENR coefficient (excess heat), the system reduces the heater power input, by an amount equal to the excess heat difference, required to maintain the pre-set [sic, preset] temperature. By this compensation calorimetry method, the measurements of net input and output power are carefully measured to within 5% accuracy to assure an exact calculation of the LENR coefficient. The heater is, I assume, DC-powered so that input heat can be precisely measured without assumptions. Input power to 5% is horrible, as to the heater power. Q-Pulse may be less precise, but with compensation calorimetry, in theory, that power could be measured to much higher precision. The description may be backwards here, I’m thinking (before studying the details in the report), rather, if the temperature rises, the compensation heater power is reduced to keep the temperature constant, and the reduction is then assumed to be excess heat. It would not be that excess heat is first determined, and then the input heating is reduced by that much. SRI has closely followed and advised on the evolution of Brillouin’s system design and materials and as such we are highly familiar with the history of their efforts to build and advance their test systems, test protocols, manufacturing techniques, specifications and core components. We closely studied Brillouin’s test data generated from extensive testing of their two IPB HHTs, especially over the past nine months since the beginning of March 2016, which is the period during which they have produced their most advanced and comprehensive test results to date. Why is Tanzella telling BE this? And who is “we”? There is only one author of this report. Table 5 has a different person who ran some experiments. We report here on the most recent nine months of extensive testing in Brillouin’s two original IPB HHTs operated at its Berkeley laboratory, and in the past two months, with the second unit having been further situated at SRI. Brillouin has manufactured five identical metallic cores and has consecutively tested each one of them in its two IPB HHTs, seemingly producing the same controlled heat outputs repeatedly. Since its reconstruction and calibration, I have been able to corroborate that the IPB HHT system moved to SRI continues to produce similar LENR Reaction Heat that it produced up in its Berkeley laboratory at Brillouin. Together with my prior data review, it is now clear that these very similar results are independent of the system’s location (Berkeley or Menlo Park) or operator (Brillouin’s or SRI’s personnel). This transportable and reproducible reactor system is extremely important and extremely rare. These two characteristics, coupled with the ability to start and stop the reaction at will are, to my knowledge, unique in the LENR field to date. Perhaps. Let’s see what is shown. The results described in this report suggest that Brillouin can now produce repeatable, small scale LENR reaction heat on the order of up to several watts of power, on a fully controlled basis, on demand. Brillouin has posited that this specific heat production is being generated from its CECR process, based on its interpretation of the precise calorimetric measurements of the input and output power in its two IPB HHTs. This joint effort has generated extensive test data, which suggest that both of the IPB HHTs have produced similar LENR heat outputs, regardless of which system is being run, and using various different core materials (key components), so long as they are run the same way each time. This would be consistent with a systematic artifact. How similar? Different core materials producing similar results suggests an artifact that does not depend on the core materials, unless this parameter space is well-explored. For a reductio ad absurdem, it produces similar results if I pack my lunch leftovers in the core? At this point, my commentary is quite critical, but I prefer to start there and back up. I will be looking to prove myself wrong. Using different batches of the same materials and standard industrial processing techniques, processed to a proprietary set of customized specifications, Brillouin has produced relatively identical components for its HHT systems, including its test cores, which recently have consistently produced these same results. In my extensive review of the test data generated from both IPB systems, from test runs made continuously at Brillouin’s Berkeley Lab in the past nine months though the date of this report, the test data showed and continues to show that LENR heat outputs up to several watts were repeatedly produced from positive coefficients in the range of 1.2X to 1.45X, depending on various factors. We feel that the calorimetry was studied exhaustively and validated to an extremely high level of accuracy (see further discussion and test data review below). In addition, I have continued to run the IPB HHT system that was transported to SRI for the past nine weeks, and it has continued to produce same kind of results. The focus on the most positive results is a common hazard in LENR studies. Up to several watts sounds more impressive than what could be the truth (i.e., as an example that fits the language): Of a hundred results, one was two watts. Most were less than a watt or even 100 mW. LENR heat outputs – reaction heat, which translates to LENR coefficients of performance (COP) between 1.2 and 1.45 for stimulations designed to produce excess power – while finding COP’s of 1.00 to 1.05 with stimulation not expected to produce excess power such as at a 600°C temperature. A representative sample of these coefficients summarized in Table E.1, include those coefficients generated both before and after transportation of the IPB HHT to SRI. At least one core, having undergone special material processing explained in the technical section, has produced COP’s of 1.91 and 2.08. Several other test runs were above 1.5 or 1.6. However, these higher output results have so far been not as reliably repeatable. As core construction continues to improve and more protocols and parameters are tested and refined, we expect to see more of the higher COP’s. Regardless, the test results summarized herein are the basis for the conclusions in this Interim Progress Report, because of the extensive analysis they have been put through, including their repeatability and their accuracy. Brillouin and SRI are continuing to expand these test results with additional test core materials and data outputs at this time. Rosy predictions of future results make me a bit queasy about the professionalism of the one making the predictions. COPs is the plural of COP. * These cores have been shown not to produce Reaction Heat at 600°C. The LENR coefficients of performance (COPs) that have been produced in the Brillouin IPB HHTs in 2016, and the related power output levels of a couple or several Watts, especially since March of 2016, are admittedly low and small-scale. However, it would be a mistake to discount them, in light of the accuracy of their calorimetry, the consistent repeatability of their production, their controllability, and the refinement of their manufacturing techniques, specifications, and components, all leading to the same repeated results as verified independently. The transportability of the system is also a remarkable achievement from an independent review basis. While these achievements are still being produced in a test laboratory at bench scale, they are uniquely pointing to an engineering pathway to evolve an actual commercial design. I know of no other independently verified results of this kind in the field today. That the repeatability and the consistency of the system output are similar, regardless of in which reactor, the core is being operated and which core components of a given design are being used, interchangeably. To our knowledge, this is the first time in the LENR field that an independent examination of an entity’s reactor, i.e. Brillouin’s IPB HHT, is clearly demonstrating the production of a verifiable and repeatable LENR heat output with positive COPs, which are consistently initiated and uninitiated on command using system design control mechanisms. This reads like a promotional brochure. Isn’t this repeating what he already said? I don’t think that “transportable” means much. Obviously, if an experiment cannot be moved, there is something drastically off. For something relatively small, transportation has not been much attempted, but it has been done. There are three issues: repeatability (same device produces similar results, or, more deeply, same construction produces similar results — showing control), reproducibility, moving toward a set of instructions being usable to create similar results, and replicability, meaning that the same set of instructions produces similar results in completely independent hands. Each of these represents progress in being able to control a reported effect. “Potential” results are results that are considered possible, but that are not yet obtained. “Potentially,” here is a hedge word that contradicts the claims. All these claims are related to reliability. Side note: The above positive COP results were primarily produced at operating temperatures of 300°C. The ultimate operating temperature of an HHT commercial system is primarily related to the COP produced, and other engineering factors, and is not in itself a limiting factor per say [sic, per se]. In fact Brillouin has had success using similar reactors and cores operating at up to 700°C, which is a much more desirable operating range for the commercial HHT systems that Brillouin anticipates building. This is backwards. The COP is related to the operating temperature and “other engineering factors,” mostly insulation. If a higher operating temperature is desirable (which it probably is! ), why were these tests mostly not done at higher temperature? Perhaps to simpify, but … I would expect much stronger reactions at higher temperatures, and the temperature is a function not only of input power but of insulation and cooling. Again, why is Tanzella telling Brillouin about their plans? Since August 2012, SRI has been performing tests on two different versions of Brillouin Energy Corp.’s low energy nuclear reactors (LENR) under SRI project P21429. We have operated these reactors to independently attempt to verify results that Brillouin has found with these reactors and type of reactors. We have also monitored and advised Brillouin on the results found in reactors operated by Brillouin in their own laboratory. This report documents the results obtained by studies in SRI’s laboratory, as well as verification and validation of results obtained in Brillouin’s laboratory over the past nine months. Brillouin has indicated that it has designed the control systems in its reactors to drive the underlying physics of LENR, as described in its Controlled Electron Capture Reaction (CECR) Hypothesis, which is how it believes its reactors generate controlled LENR Reaction Heat. This study did not attempt to prove or disprove Brillouin’s Controlled Electron Capture Reaction (CECR) Hypothesis. The last two sentences are repeated from above. In fact, this “Introduction” matches the introduction section in the Executive Summary. I haven’t check every word! But it’s basically a copy. So I’m not reviewing this introduction section again. The systems tested and described in this report consist of three parts – cores, reactors and calorimeters. The cores are the reactive components of the system. The reactors provide the environment and stimulation that causes the cores to produce reaction heat. The calorimeter is used to measure the thermal efficiency and absolute heat produced by the core-reactor system. The calorimeter was designed by both SRI and Brillouin personnel to be perfectly matched to the reactor, whose results are described in this report. SRI has brought over 75 person-years of calorimeter design, operation, and analysis experience to this process. We have used our expertise in low energy nuclear reaction (LENR) calorimetry – the ability to measure input and output power in the form of electricity or heat (energy balance power gain), to validate the results that are summarized in this Report. Brillouin’s system design utilizes compensation calorimetry, where the core and reference temperatures are held constant by varying the input heater power while applying different types of stimulation which also input power to the reactor/calorimeter. The cores consist of a metal substrate, which in some configurations includes a heater and thermocouple, with several spray-coated layers. Generally, these coatings alternate between a hydrogen-absorbing metal and an insulating ceramic. One example is shown in Figure 1. Other designs may have more or less layers. All of the layers are porous, allowing the gas(es) in the reactor chamber access to all coatings. There is a heater and thermocouple in the center of the core. The power to the heater is measured directly from the voltage and current supplied by the direct current (DC) power supply. A “metal substrate” will not “include a heater and thermocouple.” I worry a little about a heater and thermocouple in close proximity, but that’s a detail to be addressed later. Any change in the “configuration” may change the heat flow characteristics. I think that “includes” may have been “encloses.” The entire assembly is being called the “core” as it is a cylinder. The outer layers of the cylinder are the presumably active metals and the insulating ceramic. What kind of insulating? Electrical or heat? I think electrical. The heater is a cartridge heater, the construction may be important. The thermocouple is placed how? Is the heater cartridge filled with a heat conductor? Starts out at those dimensions? Where does it end up? What is the inner diameter of the core cylinder? Is this filled with a heat conductor? Is it a tight fit or loose? Thermal conductive grease? 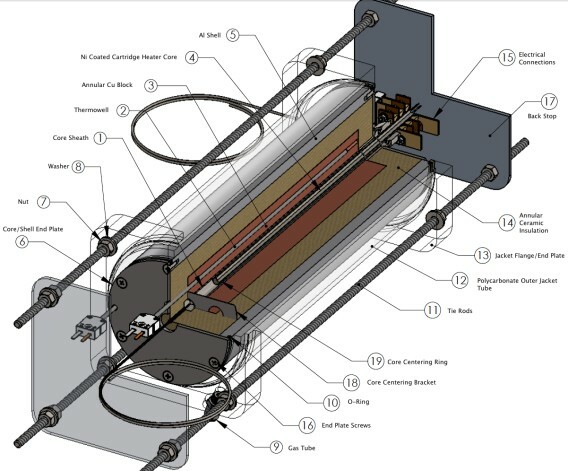 A photograph of the reactor/calorimeter system is shown in Figure 2. The system is contained in an acrylic container filled with argon gas to minimize the probability of a hydrogen-oxygen reaction from any H2 that might leak from the system. A schematic diagram of the reactor/calorimeter system is shown in Figure 3. In a traditional isoperibolic calorimeter the reactor temperature is distributed along a massive thermal block (inner block) surrounded completely by a thick insulating layer, which itself is surrounded by another thermally conductive metal mass (outer block). This latter block is kept at a constant reference temperature. Referring to the labeled parts of Figure 3, the core (4) is centered in and insulated from a metal sheath (1). This core/sheath combination together with the electrical connections (15) comprise the reactor. An annular copper block (3) is in intimate contact with the reactor sheath and contains a thermowell (2) and thermocouples and acts as the inner block. This copper block is surrounded by an annular ceramic insulator (14). Surrounding this insulator is an aluminum shell (5) with thermowell and thermocouples. This shell, kept at constant temperature by flowing temperature-controlled water between it and the outer acrylic sleeve (12), serves as the outer block. Argon gas is circulated through the chamber outside of the calorimeter. Acrylic (above) or polycarbonate (diagram)? Rise time? “very fast” is vague. I expect that this thing might ring like crazy. I am unclear about how the circuit is completed. How does the current travel from layer to layer? Through capacitance? An “offset” is shown. Offset from what? The stimulation power imparted to the core is measured using a circuit shown in Figure 5. The pulse is generated by a proprietary Q Pulse board and delivered to the core using series and termination resistors which help match the load impedance to that of the pulse board output. Using a high speed oscilloscope, the voltage across the end of the core nearest the pulse board is measured as well as the voltage across the opposite end of the core across the termination resistor (Zterm). Zterm also acts as a current measuring resistor. The root mean square (rms) voltage across Zterm is then converted to the rms current. Determining an rms voltage from an oscilloscope is an imprecise business. The voltage across the core is determined using the method shown in Figure 6. Figure 6a shows the two voltage traces being aligned in a way that minimizes the time difference. This overestimates the power imparted to the core since any phase lag between voltage and current would impart less input power. This voltage difference is shown in the upper plot of Figure 6. The current is shown in the middle graph and the product of these two (power) is shown in the lower plot. It has been shown that the power calculation is essentially the same (within measurement error) whether it is calculated by multiplying the current and voltage plots point by point or by multiplying the calculated rms voltage by the rms current. I am confused by the first plot. What does it show? Yes, voltage across the core at one end, and voltage across the termination resistor at the other. But what does it mean that the traces are “aligned”? In compensation calorimetry the heater power is varied to keep the core at constant temperature, which generally keeps the inner block at a constant temperature. The difference between the heater power with and without stimulation determines the effect of the stimulation. If this difference is greater than the stimulation that reaches the core, then energy is being produced in the core. Approximately 50 different parameters are collected allowing for calculation of Reaction Power (the power produced by the process induced by the pulse stimulation). Several calculation methods are possible from these parameters. In the Analysis section we describe the two used in this report. Figure 7 shows a screenshot from the specially-designed proprietary automation and data collection computer program used to control and collect results from the IPB reactor/calorimeter system. The program has several panes allowing for control of temperature, pressure, pulse voltage, pulse power, pulse width, and pulse repetition rate and gas composition. The program also collects the heater power, the pulse power at the generator as well as at the core, all temperatures, water flow rates and gas pressure. Hydrogen and oxygen concentration in the argon blanket are also measured and collected. In all approximately 50 different parameters are collected and stored every 10 seconds. A sequence file can be used to automatically change any or all of these parameters at specified intervals over a multi-day or multi-week period. The sheath containing the core is operated with a static fill of hydrogen, helium, or argon gas held at constant pressure up to 10 bar. The temperature of the core is held constant using its embedded heater and thermocouple and controlled from 200°C to 600°C. The outer block temperature is held at 25°C by constant temperature water flowing from a Neslab® chiller. The power emanating from the Q-pulse generator board is held constant as chosen by the program’s front panel or the sequence file. Generally the pulse amplitude (voltage) and pulse width are chosen. The repetition rate is adjusted automatically to maintain the chosen pulse power. Only a minor fraction of this power reaches the core as most of it is lost as heat in the electrical components and the transmission line. Of that reduced power only a portion of it influences the heater power as explained in the “Measurement” subsection above. The actual pulse power is measured directly via the methodology presented above. Operating in power compensation mode, the computer keeps the inner core temperature constant in its set point. When power is imparted from the Q-pulse the heater power is reduced to compensate and maintain a constant temperature. Hence the core temperature, and the inner and outer block temperatures are all held constant. First operating in He gas, a sequence was operated from 200°C to 600°C in 50°C intervals. At each temperature a given DC power was applied to the coating on the core. This process was then repeated but applying constant power pulses varying pulse width at each temperature. Finally, both automated sequences were repeated in hydrogen gas. I like that temperature is controlled, for study purposes. I’m seeing a lot of variables, but hoping this was done carefully. What I worry about is that hydrogen gas may change the electrical or heat transmission characteristics of the coax. How could such a change be distinguished from heat? They have the potential here of two partially independent calorimetric modes, i.e., compensation calorimetry, and flow calorimetry. Because of time delay, if there is a change in heat being generated, it will show up as a temperature rise before the compensation heater can change it. That temperature rise will be proportional to the change in heat, and that is isoperibolic, because the outer block is solidly maintained at a constant temperature — if it is — and there should be constant heat resistance between the inner block and the outer block. I thought the nature of the construction here should provide low heat resistance between all components except the ceramic insulator, which is basically a heat insulator, and which has a temperature difference across it of the inner block temperature minus “25 C.” In the system diagram below, it is over 26 C, and shown is a temperature difference between the internal heater and the cylinder of over 17 C.
The termination resistors and the Q-pulse PCB are separately heat-sinked to the chiller line, with separate flow meters and a pair of RTDs in each line. Room temperature 28.29 degrees C. That’s toasty! Why are they using a chiller? Perhaps they want to be ready for major heat… I think this is not the room temperature but the temperature of the argon atmosphere inside the plastic box. In our IPB design only a fraction of the stimulation power is imparted to the core heater control because the heater/thermocouple combination is only in contact with approximately half of the core’s length. The actual fraction imparted to the core is determined by resistively heating the core’s coatings using different powers sourced from a well-measured DC power supply and measuring the heater’s response at different temperatures. At each temperature, a linear function (Pdrop = m*Pcoating + b) is determined between the power imparted to the core’s coating via resistive heating and the power reduction in the internal heater necessary to maintain temperature. Representative linear coefficients at different temperatures are shown in Table 2. If it has been verified that hydrogen loading does not affect the core heat conduction characteristics, as well as where in the core the heat is dissipated, this could be okay. However, this is starting to hurt my head, i.e., to become complex. Pure compensation heating requires locality; instead we have a complex structure with varying heat transfer functions between the parts. How is direct current run through the coatings to heat them? The image I had was of electrical connections to the outer layer, on one side, and the inner layer, on the other. (perhaps no connection to inner layers?) If the inner and outer layers are each connected on each end, then current can be run transversely. This is different from the Q pulse power, which would be running between the inner and outer layer through capacitance. If there is non-uniformity in fabrication, the heat may not be uniformly distributed along the length of the core. I would really want to carefully study the behavior of this heating. Has that been done? What is it that changes with temperature here? The heat characteristics of the coatings? This may be sensitive to the particular fabrication. The basic calorimetric calculations are shown in Equations 1 through 4 when the isoperibolic calorimeter operates in heat flow mode. Heat flow (Qflow) is measured using Kflow, which is determined via calibration and the temperature difference between the inner and outer blocks. Heat loss (Qloss) represents the heat loss to air that is not accounted for in Qflow and is also determined via calibration. The output heat (Qout) is the sum of Qflow and Qloss. The input heat is the sum of power applied to the heater (Qheater) and the amount of heat experienced by the heater from the pulse (Qpulse). Hence the heat due to the reaction (Qreaction) is the difference between the output and input heats. We use the subscripts [superscripts] 1 to mean operation without Q power and 2 to mean operation with Q power. 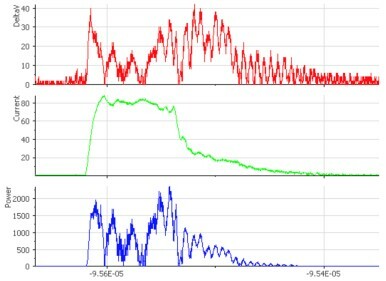 In power compensation mode, we compare the heater power imparted to the core with and without Q pulses applied. Because Tcore, Touter, Tair are held constant in this mode, Qflow and Qloss are the same with and without Q power. As such Equation 4 cannot be used to calculate Qout in power compensation mode. The difference between Qreaction¹ and Qreaction² is shown in Equation 5. When Q pulses are not applied Equation 6 defines Qpulse and Qreaction to be zero. This simplifies equation 5 to that shown in Equation 7 where ΔQheater is the difference between the heater applied with and without Q pulses and ΔQout is output power with and without Q power. The empirical determination of ΔQout is shown in Equations 8 through 10. Replacing pulses with DC power through the core to emulate the physical source of the heat, as described in the measurement subsection, allows us to determine the amount of Q pulse power that affects the core heater power when Qreaction = 0. Rearranging Equation 7 where Qheaterdc is the heater power when DC power is applied to the core coating, Equation 8 allows us to calculate ΔQout at different applied DC powers (Qdc). Finding the linear fit parameters from the plot of ΔQout vs Qdc, Equation 9 shows us the relationship between applied DC power (Qdc) and the DC power output to the environment (ΔQout), which cannon [sic, cannot] be measured directly. The same equation can be used to find ΔQout with Q power applied substituting (Qpulse) for Qdc. Equation 10 shows the calculation of Qreaction when operating in power compensation mode where ΔQheater + ΔQout would equal Qpulse (or Qdc) when Qreaction =0. Equation 11 defines our effective coefficient of performance for the power compensation mode for our isoperibolic calorimeter system. The second method of analyzing the calorimetry is more direct in that instead of calculating the power loss by the calorimeter it determines the amount of heater power compensation (HPC) for different amounts of DC calibration power. In fact, this method is analogous to the traditional isoperibolic calorimeter analysis except that it substitutes heater power compensation for the temperature difference. In order to calculate Qreaction as output power minus input power, Method B compares the heater power compensation (HPC) from DC calibration to that from pulse stimulation. 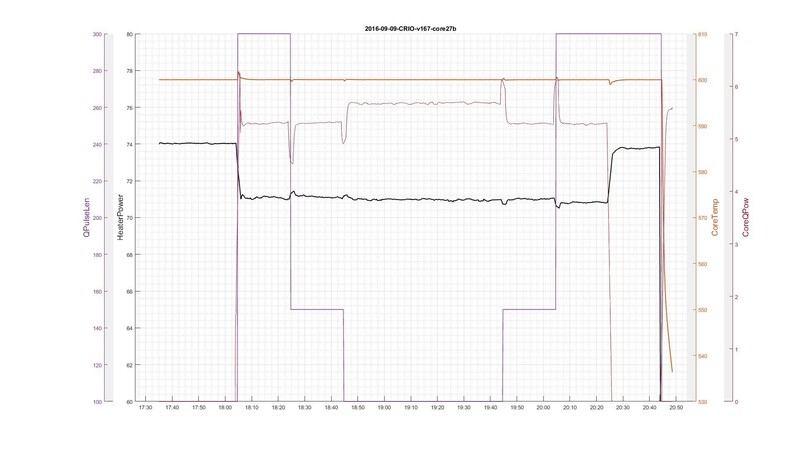 Using this DC calibration the relationship between input power and HPC is determined so that with input pulse power the HPC can be used to back calculate the power from the pulse imparted into the core. First the linear relationship between HPC and DC power (Qdc) is found by fitting a linear equation to HPC vs Qdc when Qdc is varied across the range of “pulse. These linear coefficients are then applied to measured Qpulse to calculate HPC(DC), the amount of HPC expected as if the pulse power were DC power. Qreaction is then calculated as shown in Equation 12, where HPC(Q) is the actual HPC measured when the pulse is applied. Equation 13 is then used to calculate COP. The linear slope coefficient is similar to the value “m” used in Method A. Method A uses the fit to determine the input power lost to the environment and Method B uses the fit to determine the percentage of input power that interacts with the core’s heater and thermocouple. Table 3 shows the values for “M”, the linear fit coefficient from Method B. This is a horrific chart. The point of charts is to make information quick to understand. For me, this chart generates confusion that will require work to overcome. I am accustomed to seeing, for something like this, the controlled variable along the X-axis and the result plotted vertically. However, this is a time plot. So the variable is shown with different plots. With no clear relationship. With some consideration, I notice the labels on each side are colored the same as the four plots. I see they are controlling Qpower — i.e., Qpulse, if I’m correct — but that requires making other changes. Constant power can cause problems. Constant power is really constant current, with, then, the current setting changed to keep the power constant when the voltage varies, perhaps because of a change in resistance. Holding the power constant with a high-speed pulse train could be a mess. The proof is in the pudding: has all this been carefully calibrated and shown to be correct across varied operating conditions? Then the pulse width is lowered to about 150 nsec. Nothing changes. Then to 100 nsec. The power increases to about 5.7 W. There are substantial glitches in the excess power when pulse width is changed. These glitches precede the pulse width change by a couple of minutes. When the power is increased, the glitch is a upward pulse. When the power is decreased, it is downward. When pulse width is changed, it is an immediate change. It would happen first of any effect from the pulse width changed. Instead, the calculated reaction power changes first. If this was manually recorded data, or manually integrated from different recording systems, this could be a charting error. However, this data reportedly came from a single system and all the data would be time-stamped or recorded in blocks by specific time. In fact, there can be delays, but not several minutes. Something is very off here. Setting that aside, the pulse width was increased back to 150 nsec. The output power went down to where it was at 300 and 150 before. 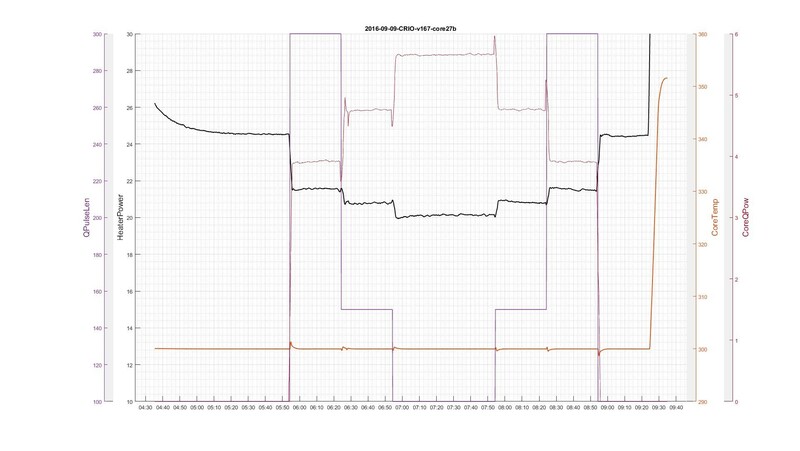 Pulse width to 300 nsec, after the glitch, power roughly constant, then about 20 minutes later, the output power dives to zero, while the pulse width is still 300 nsec. There is no explanation for the obviously odd behaviors. The heater power does change with pulse width. The effect is somewhat concealed by how the data has been plotted. Notice that at the second rise to 300 nsec, the heater power drops by maybe 300 mW, while the output power remains about constant. This indicates to me that the pulse power is not being held constant. The same issue here, the output power rises before the change in pulse width. The same glitches. I’m thinking that there are events happening that are not described, like turning on pulse stimulation, and this is a charting problem, cause by having the lowest value for pulse width being the same as the chart bottom. In fact, pulse width could have been a separate chart, say at the bottom. This all is the same core. The variation is mysterious. The controlled variable is the core temperature setting. To display this, I’d want to see, not a pile of confusing and largely irrelevant data, but a plot of output power, instead of COP. What this looks like is COP increasing to 300 C, then declining rapidly with just a little more temperature (to 350 C.) This is not expected behavior for LENR. However, they give an explanation later. Maybe this design does have a maximum temperature, but where then does the confidence come from, above, about systems at 700 C? I suspect this is not six runs, it is one run, where for periods of time the temperature was set and increased, all the same day. The core might become exhausted, explaining the lower heat at higher temperatures. What would happen with the temperature starting out high? Too many variables at once. This is a mess. It is important to note in Table 4 that the runs performed at 300°C showed COP significantly greater than 1.0 while those at 600°C are essentially 1.0 within experimental error. This can possibly be explained as the Pd inner layer totally de-loading its hydrogen as we have seen before at this temperature and the Ni, although retaining hydrogen traverses its Curie point, changing its electrical and chemical properties. Similar results have been seen from more than 50 runs performed over this period. Recently Method B was used to calculate COP from some more recent runs similar to that shown in Figure 9. As shown above operating above 600°C usually does not yield any reaction heat. Recent runs were operated only up to 400°C. Table 6 summarizes Qreaction and COP calculated from recent runs analyzed using Method B. “Run” is not well-defined. I would want to see a “run” be an experiment where there was no variable in conditions, then a series of runs all the same. 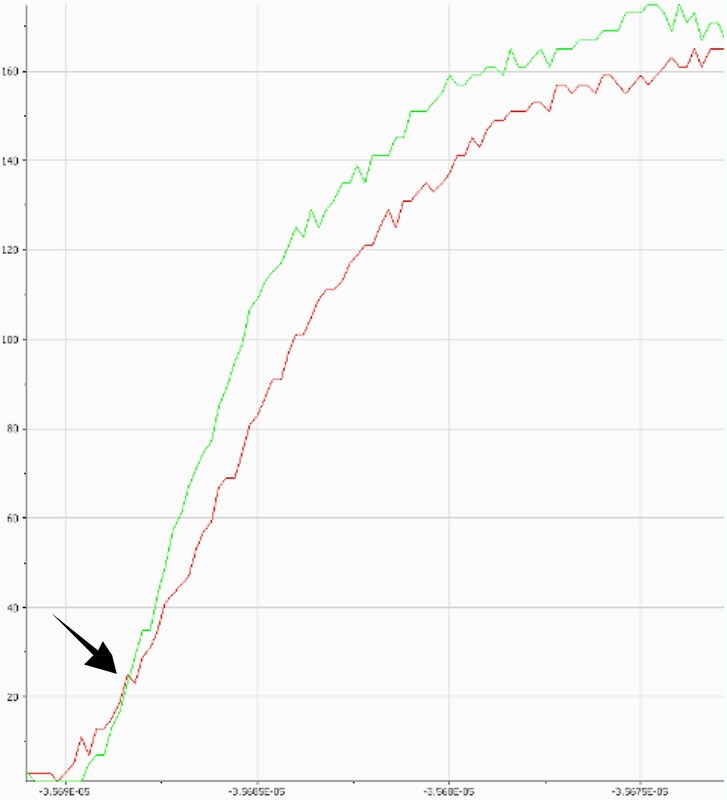 And a series of runs where only one variable (like set temperature) changes. And a series of runs where only pulse width changes. There are many more test runs that occurred with Brillouin’s IPB HHTs, which can be analyzed using these and other methods but the COP’s found in those tests are very similar to the runs that were examined and summarized in this Report. I’d want to see for each run, comparison between the two methods of calculating heat production. “Very similar” is very unsatisfactory. If conditions are controlled, how similar are results? Individual core history may be important. Low energy nuclear reactions (LENR) can produce thermal power when Ni, and other metal, coated tubes are stimulated using fast rise-time pulses. These experiments operated in H2 or He gas from 200°C – 600°C. The exact same procedure was performed in each gas. Comparative thermal measurements were performed between heater-only power and heater and pulse power. These runs were performed in isoperibolic calorimeters operated in power compensation mode, where the heater adjusts its power to keep the inner and outer temperature-difference constant. Over 100 runs were performed on five different Ni-coated cores. Three additional cores were also tested for other experimental purposes. COP’s from 1.0 to over 2.0 were measured depending on stimulation conditions. Recent test runs have not averaged above 1.5, although the core’s coating composition and metallurgy are still being optimized. Better calorimetry is regularly being optimized and implemented. The results of those comparisons with H2 and He are not shown. This is an independent calibration. Unfortunately, there can be variations in heat transfer from changing the gas. At these relatively low powers, strong evidence may require determining the ash and measuring it. Low-deuterium hydrogen can be used, with long accumulation times, in case the ash is deuterium. I would like to acknowledge Dr. Michael McKubre (SRI Emeritus) for his work on the calorimeter design. I would also like to thank Brillouin Energy engineers Cedric Everleigh and Jin Liu for their aid in the calorimetric analysis. And I would like to thank everyone at Brillouin Energy Corp. for their highly creative, disciplined and highly professional technical work, which continues to show that they are a leader in this field. But maybe they actually are leaders. By comparison. I’m concerned about the lack of data here that would show the reliability claimed. If Tanzella has that data, he has not shown it. Why not? What was this report for? He talked about 100 runs on five cores. How do results vary by core? Does a core continue to operate at the same level, or does this change with core history? Table 5 was called “six runs,” but it was all one one day. So 17 days of work? Or 100 days? The report is labelled “Client Private,” and if this is what I saw from all that work, I’d be quite disappointed. It looks to me like he is holding back data. Why? Yes, BE may want to not release some data, but …. they wouldn’t have to release his report and could ask him to write a brief summary for public release. So, again, something is off, something I don’t understand. Summary so far: I am not impressed. However, now I will look at other critiques of this. One thing in the original critique that I must object to is the suggestion that SRI cannot execute an independent evaluation of a client’s technology when we’re being paid by the client. SRI does that for the government to the tune of 100’s of millions of dollars per year. We are trained to compartmentalize our efforts such that every program yields trustworthy analysis, regardless of who is paying. Without that reputation, SRI would never survive, and the US government would never trust any of the conclusions found by SRI. One more point: apparently there was an ICCF-20 presentation and will likely be a better-edited paper, possibly with additional results. What does “peacock language” mean? Sorry, it’s a Wikipedia term for puffery. 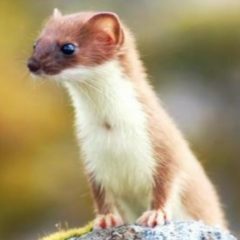 Here is a good article on it: Avoiding peacock and weasel terms. Thanks for pointing out that some may not know what this means. I’ve added a link to that article. for writers, and especially journalists, it is highly useful to know about peacock and weasel. There are reverse equivalents about yellow journalism. Weasel is used both for positive and negative opinion, but peacock is, by definition, positive.